Our bodies are constantly changing as we age. Although the most rapid development occurs during childhood and adolescence, our bones, soft tissue and bodily systems will continue to change, even as we enter old age. That includes our mouth and facial structures. Over time change will result in a flatter facial profile: this will cause the nose to gain more prominence as the lower part of our face becomes shorter. The extent of our lip movement can also change with time, resulting in less of our teeth appearing when we smile. The teeth themselves will also wear, which can make them appear shorter. These and other aging consequences should be taken into account in our dental care. We should consider their impact on the health and function of our teeth (the therapeutic aspect) and our appearance (the cosmetic aspect). Rather than less attention, the effects of aging often require a multi-layered approach to care. The foundation for this care, of course, isn’t laid when we reach our middle or later years, but with the regular and special treatments we receive when we’re young. For example, the best time to address teeth alignment and bite is usually during early adolescence. Orthodontic treatment will certainly improve dental function and smile appearance in the short term; but improving the bite can also have implications later in life. By anticipating how the soft tissue and bone structure within the face and jaws will continue to develop, we can better determine the final teeth position we wish to achieve. This creates satisfying results in the present and a more stable platform for oral health in the future. We can apply the same approach to other areas, like the position of the lower jaw. Using orthognathic surgery to reposition it will benefit jaw development throughout adulthood. Making these improvements can diminish the effects of aging later in life. 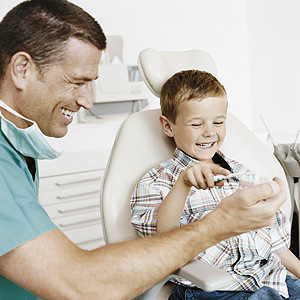 In essence, dental care is a life-long endeavor that begins when we’re very young and continues into our senior years. Properly caring for your teeth at any age is the key to enjoying good oral health for your entire life.